Yuilop, the cloud-based calling and messaging service, has today introduced its Yuilop.me mobile phone number option for UK users, allowing them to receive calls more easily across multiple devices and avoid roaming charges while travelling, providing WiFi is available. The service, which also works on 3G and 4G connections (although we wouldn’t recommend using data services abroad without a decent roaming package in place), allows users to make free calls and send free messages to anyone – including those who don’t have the Yuilop app – by providing them with their own unique phone number on the PSTN (Public Switched Telephone Network) like a traditional network operator. And like other UK mobile numbers, they all start with ‘07’. “You get a full mobile phone service in the cloud […] We try not to be another OTT (over-the-top) silo, there as so many out there […] users can only use them within the silo with others that use the same application. We’re trying to unite the best of both worlds. Yuilop did already have an app available to UK users, but it was more akin to rival IM and messaging apps than the full “mobile service in the cloud” that Yuilop launched today, meaning that it had no permanent full phone number options. So, while free phone calls to anyone (and from anyone) sounds like an ideal situation, you will need Yuilop credits in order to make outgoing calls. However, Doppelhammer insisted that simply using the service should keep you in enough credits to allow free outgoing calls. It’s a bit like using Skype Out, except that you earn the credits for free, Doppelhammer went on to explain, but unlike rival services, by using the PSTN it avoids some of the complexity of forerunners in the market such as RebTel which required having specific alternative numbers for each contact. If you do find yourself a little short on credits still, there’s always the option of earning more by inviting friends to use the service, watching ads or downloading offers from the Yuilop offer wall. Despite needing credits to make outgoing calls today (although not in the US due to the way the telephone system works there), Doppelhammer hopes that as the company grows (it currently has around 5 million users) to around 100 – 200 million users it will be able to do more partnership deals, ultimately allowing it to be able to move its credit-based system to the background. 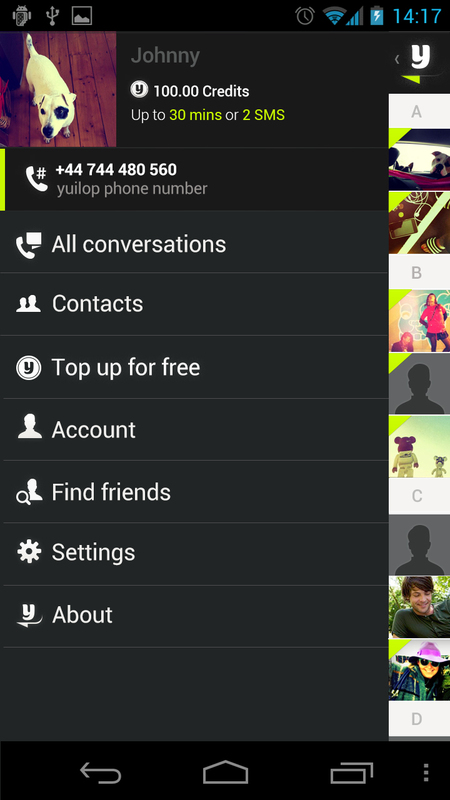 Yuilop launched as an SMS and messaging-only app first in Germany in 2011; it then added VoIP and has since been made available in more than 100 countries. Yuilop.me, however, is currently only available in Spain, Germany and the US, and now of course, the UK. Doppelhammer confirmed there are also other countries with a Yuilop.me launch plan in the pipeline. He also spoke of aspirations of launching a video calling service within Yuilop, which Doppelhammer said would be easy enough to add to the platform due to the way it was designed, but noted that the company would be in no rush to introduce it. Yuilop.me certainly seems like it’s presenting an interesting proposition for voice calls, SMS and messaging – and right now has the advantage of offering them against a credits-based system, rather than an actual cash system, making it a whole lot more enticing to at least try out. How well it will fare in the long run will largely depend on how quickly it can scale up its Yuilop.me service and gets other partner deals on board to eventually phase back that credit system. But right now, it’s one of very few companies in the UK that is claiming to bridge the gap between a traditional telco and a VoIP provider that is actually making strides to do so.